Former manager of Shattta Wale, Lawrence Asiamah Hanson known in showbiz circles as Bulldog was spotted at the premier of Shattered lives. Shattered lives is a movie directed by Okechukwu Onyeka and produced by Ghanaoriginal.com, the company that created Ghanaairtime.com. 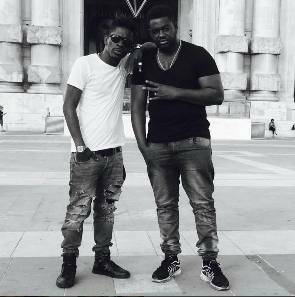 Bulldog who parted ways with Shatter Wale in 2015 due to a misunderstanding, showed up at the premier of Shattered lives a movie which features Shatta Wale himself, Bisa Kdei, Majid Michel, Martha Ankomah and Bismark the Joke. As to whether he was there to throw his weight behind his former artist, see what Shatta Wale is capable of doing or to see the movie in totality none of these have been confirm by Bulldog. Bulldog is currently the manager of Rudebwoy Ranking and both are doing pretty well as manager and artist.